This opportunity was an accidental rneeting with two persons sent from Boston in Lincolnshire, with a sum of moui-y to obtain from the pope a renewa! of the indulgences or pardons to be obtained at the gild of our lady in the church of St. Botolph’s in that place. 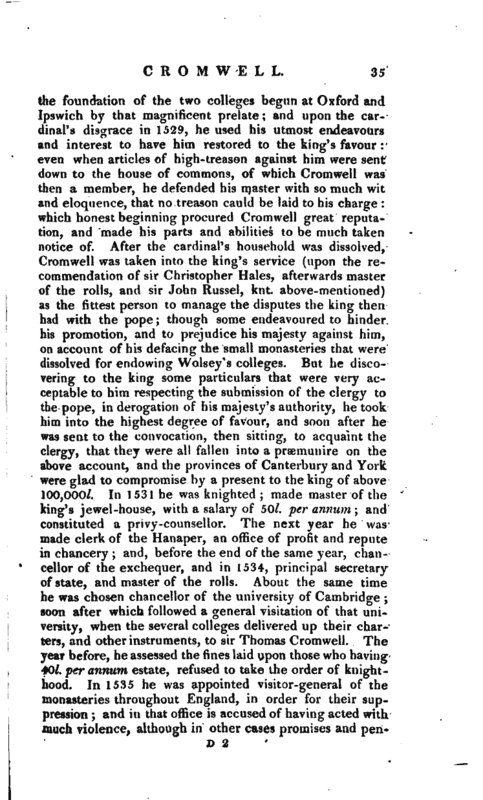 Cromwell met them at Antwerp, and they thinking him better qualified than themselves to accom plish the object of their journey, persuaded him to go along with them; and, besides the money, Cromwell if said to have so pleased the palate of the pope (Julius II ) by a present of some dainty jellies, made in the English fashion, that he granted him his request very readily. Fox’s Acts and Monuments. It would have been well for Cromwell if he could have taken the advice sir Thomas More gave him, when he first came to court, namely, “to tell the king what he ought to do, and not what he was able to do.” Yet a minister of this cast would not long have been minister to Henry VIII. The whole charges bear marks of gross misrepresentation and injustice. 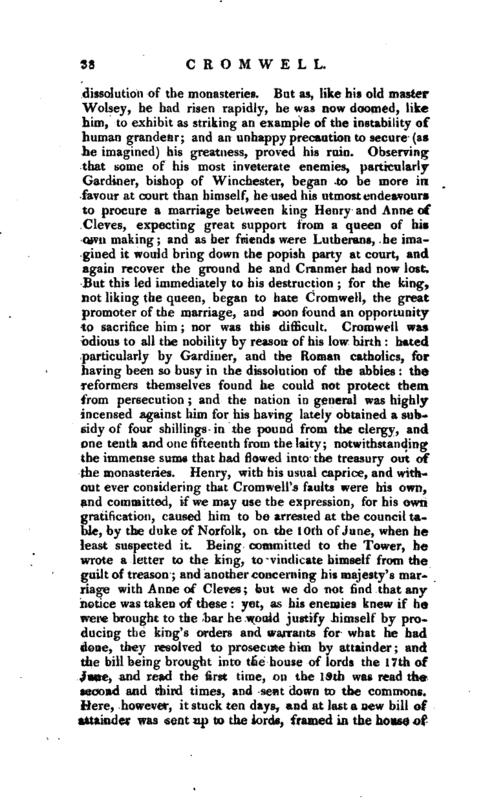 It is rather singular that the first should have been admitted, which is a direct reflection on the king, namely, “That his majesty having received Thomas Cromwell, a man of very base and low degree, into his service, advanced him to the title of an earl, &c.” The fact was, that every thing Cromwell did was by the king’s authority, and too many things in servile submission to him. The possession of this house, on which Drapers’ hall now stands, has been objected to Cromwell, as if he had pa’ui but little regard to his neighhour’s property. 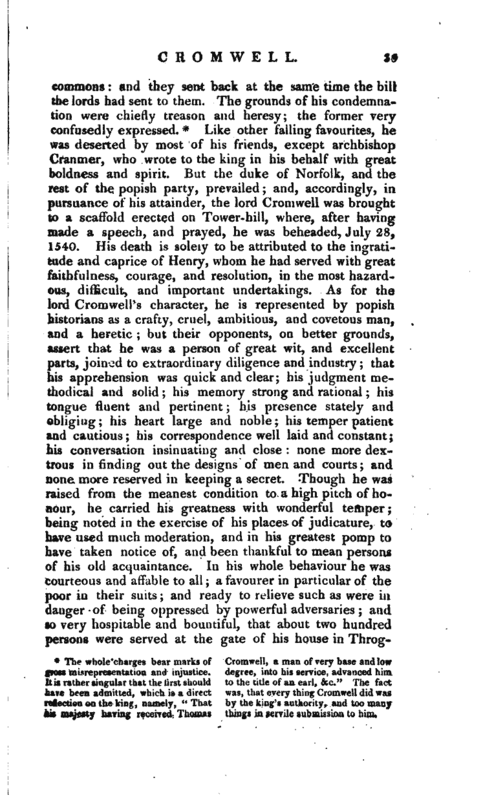 Stowe mentions his own father as a sufferer; for the earl arbitrarily loosened from its place a house which stood in Stow’s garden, placed it on rollers, and had it carried twenty-two feet farther off, without giving the least notice. This, at least, says Pennant, shows what miserable tenements a certain rank of people had. After Cromwell’s fall, his house and gardens were purchased by the Drapers’ company, in whose possession they still continue. He must be regarded as one of the chief instruments in the reformation; and though he could not prevent the promulgation, he stopped the execution, as far as he could, of the bloody act of the six articles. 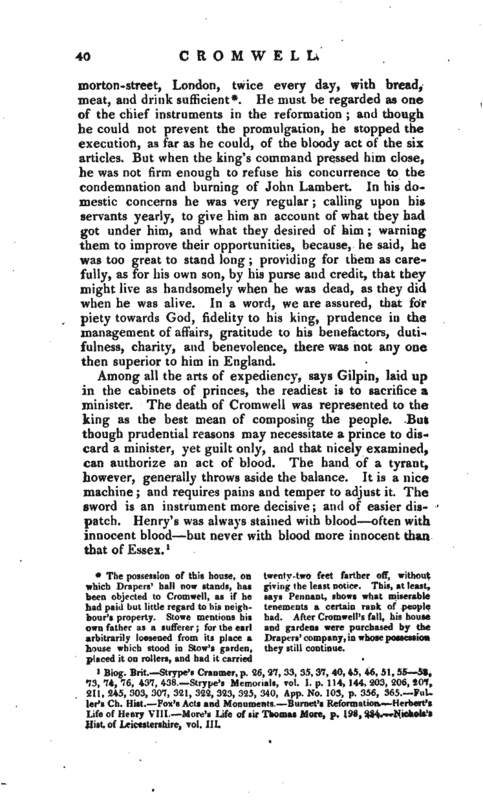 But when the king’s command pressed him close, he was not firm enough to refuse his concurrence to the condemnation and burning of John Lambert. 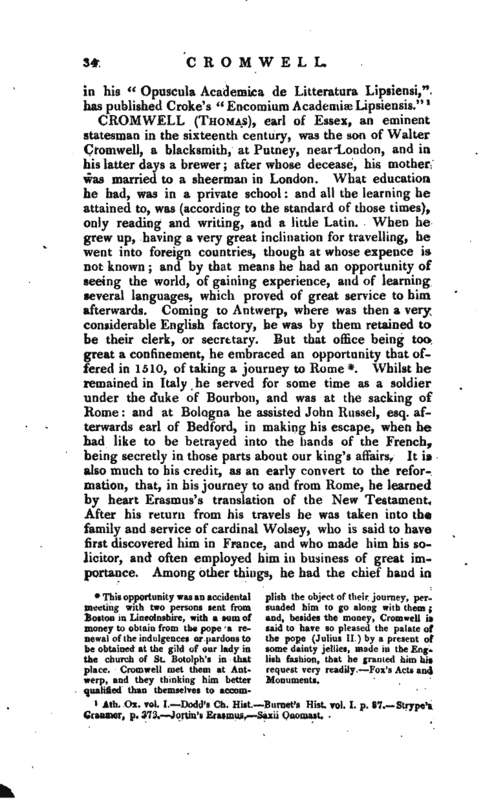 In his domestic concerns he was very regular; calling upon his servants yearly, to give him an account of what they had got under him, and what they desired of him; warning them to improve their opportunities, because, he said, he was too great to stand long; providing for them as carefully, as for his own son, by his purse and credit, that they might live as handsomely when he was dead, as they did when he was alive. In a word, we are assured, that for piety towards God, fidelity to his king, prudence in the management of affairs, gratitude to his benefactors, dutifulness, charity, and benevolence, there was not any one then superior to him in England. Biog. Brit.—Strype’s Cranmer, p. 26, 27, 33, 35, 37, 40, 45, 46, 51, 55—58, 73, 74, 76, 437, 438.—Strype’s Memorials, vol. I. p. 114, 144, 203, 206, 207, 211, 245, 303, 307, 321, 322, 323, 325, 340, App. No. 103, p. 356, 365.—Fuller’s Ch. 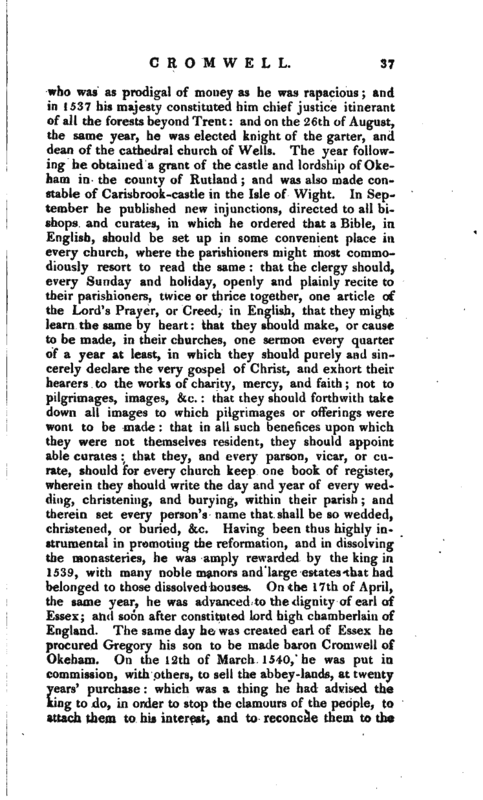 Hist.—Fox’s Acts and Monuments. 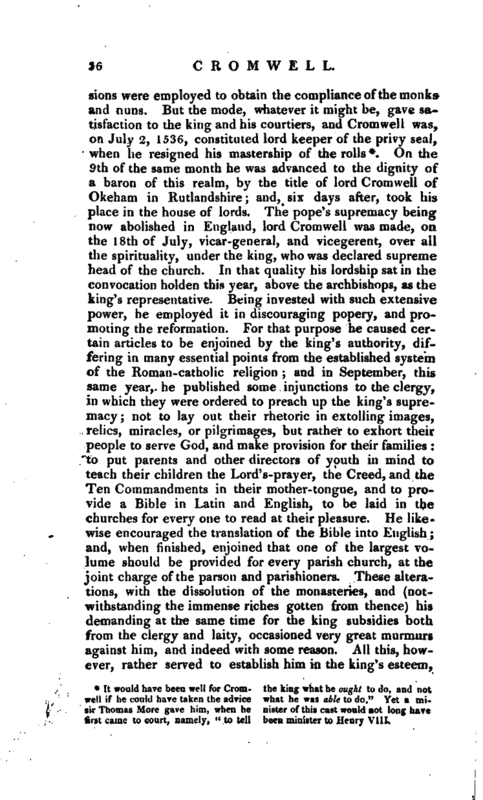 Burnet’s Reformation.—Herbert’s Life of Henry VIII.—More’s Life of sir Thomas More, p. 198, 254.—Nichols’s Hist. 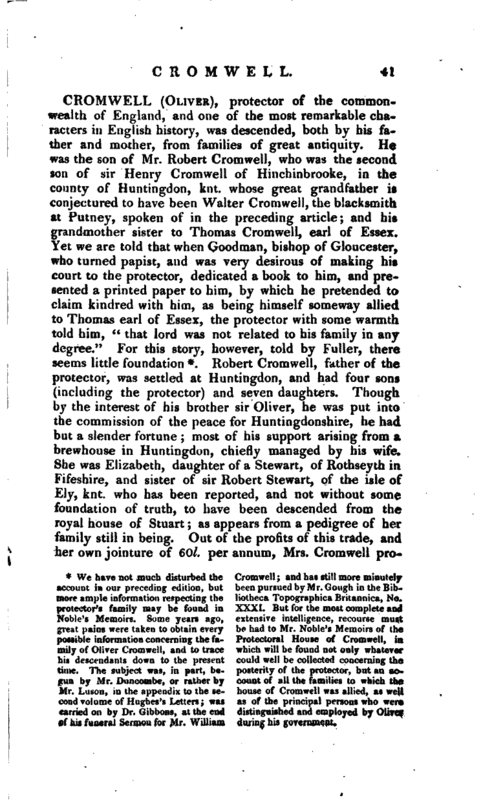 of Leicestershire, vol. III.